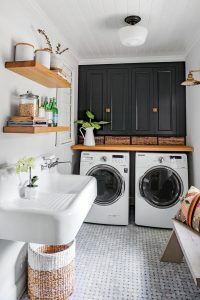 In decades past, laundry rooms were more of an afterthought, often relegated to the basement or tucked into an odd corner of the house, if space allowed. 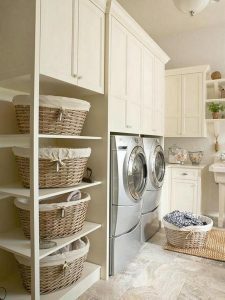 Thankfully, the tide has turned, and homeowners are putting more thought into both the fun and functional aspects of their laundry rooms. Most adults could attest to the inordinate amount of time spent doing the laundry, from the sorting to washing, drying, and folding, so why not make this space as enjoyable as the rest of your home? Here are three questions to ask yourself, along with practical advice for finding answers that will guide your laundry room renovation. How should I prioritize FUNDS for my laundry room renovation? The answer to this question will best be found by determining which part of your laundry room is most important to you. If the size of your household translates to large amounts of laundry, you may want to invest in top-notch appliances with large capacity function. After taking into consideration your available space, research your options at a local appliance retailer. If space is at a premium, you may want to consider a stackable set to maximize your footprint. 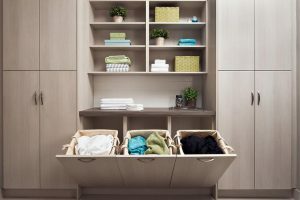 If a designated spot for folding and organizing laundry is a necessity, then consider a front loading set so you can install a counter over top. If you have young, active children, you may prefer a top loading washer for its pre-soaking capabilities. While everyone will have an opinion, you will know your individual needs better than any expert. If storage is your foremost objective, then invest in quality cabinetry, customized for your individual needs. Beyond the basic laundry detergent and other related supplies, you may want to include space for cleaning products, your iron and ironing board, or room to stock up on supplies such as paper towels. Fabulous options for built-in sorting bins, drying racks, and even pet nooks can be incorporated into your design. The possibilities are as endless as your imagination. If the esthetics are a priority, consider a beautiful slate or marble floor or a tiled backsplash behind your utility sink. Invest in some new windows to improve lighting or hang eye-catching light fixtures for visual appeal. Personalize your space with floral window treatments or unique artwork. How can I increase the FUNCTIONALITY of my laundry room? If several family members share the responsibility for laundry duty, eliminate frustration by increasing order and ease of communication. Use matching baskets, labeled and lined up on shelves, to designate each family member’s items. Assign a different hanger color for each person so everyone can easily identify when he or she has laundry to iron or put away. Incorporate a small chalkboard or dry erase board to leave notes with special instructions, such as which items should not be placed in the dryer. Not everyone has the luxury of a large laundry room, so maximize your available square footage. Hang a shelving unit or a peg rack on the back of the door for additional storage. Elevate your washer and dryer by building or purchasing shelves or drawers that fit underneath. Attach a colorful curtain around the base of your utility sink to create an extra storage nook and hide unsightly plumbing. If your laundry space is more of a “glorified closet,” suspend a small ladder horizontally above the washer and dryer and use it to hang items that need to air dry. 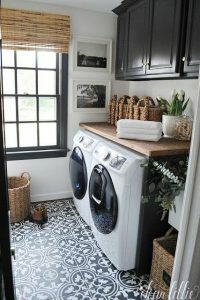 How can I add some FUN to my laundry room? 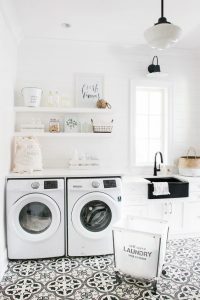 Most of us would not necessarily categorize doing laundry as “fun,” but adding a dash of character to your laundry room will undoubtedly improve your mood while sorting or folding. Consider a boldly patterned wallpaper to accent the space behind your washer and dryer. Purchase a colorful rug for inspiration, or even better, install a Moroccan-style floor or geometric backsplash. Mount a chandelier overhead for an unexpected dash of glam. Forego the standard stainless steel or white appliances and select cranberry red or ocean blue for a welcome pop of color. Think outside the box by utilizing a galvanized tin trash can as a hamper. Tie your decor together with a theme. Go vintage by utilizing a farmhouse laundry sink and displaying antique clothespins and washboards. Think “black and white” by highlighting white appliances with black chalk paint walls, or contrast black appliances against white subway tile. Bring in the great outdoors by installing a natural wood folding table or display shelves, then accent your room with some potted succulents. 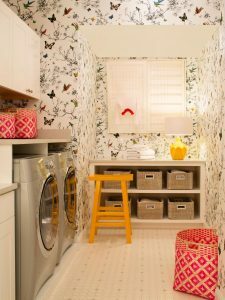 Finding the balance between function and fun will transform your laundry room into an enjoyable space for checking off the to-do list. 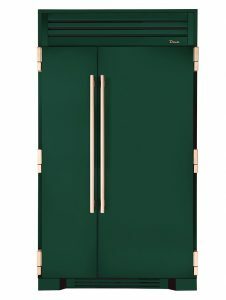 Letting room in the budget for reliable appliances as well as smart storage solutions and pretty accents will create a winning combination of beauty and practicality with long-lasting impact for the whole family. 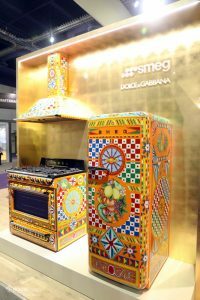 Photography courtesy of Smeg USA with Dolce & Gabbana. 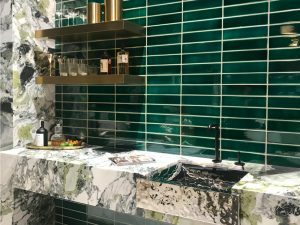 This year’s Kitchen & Bath Industry Show (KBIS), combined with the International Builders Show and held in Las Vegas last month, did not disappoint. 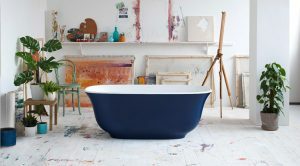 New innovations and ideas have burst onto the scene, moving kitchen and bathroom design from sleek and streamlined to colorful and creative. 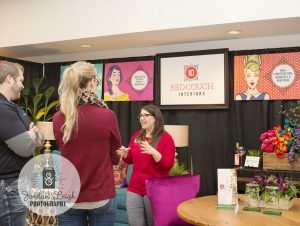 With over 600 brands revealing their newest products, the industry is clearly striving to meet the demand of homeowners who are ready to express their individualism after a season of neutral design and color. Get inspired to breathe new life into your own home as you read about the latest and greatest trends on the market. Photography courtesy of True Residential. The recent standard of gray and white is slowly fading into the background as color declares a grand resurgence. Homeowners are excited about “making their mark” as color palettes expand to include vibrant shades of navy blue (hailed as “the new black”) and emerald green. Sunshine yellow and exotic magenta introduce fresh vibrance to the scene, and even the softer dusty rose is making an appearance on cabinetry. 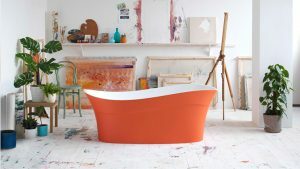 Victoria & Albert introduced a new line of freestanding bathtubs boasting 200 color options, ranging from light blue to bold orange, with a gloss or matte finish to top things off. For those who prefer to dip a toe into this world of color rather than diving in headfirst, options such as changeable faucet wraps allow you to ease into the new color trends more gradually before making a bolder commitment. Photography courtesy of House of Rohl. Let’s get personal! 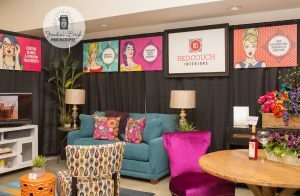 The kitchen and bath industry displayed new options for customizing your home for a unique and distinct touch of individuality. Cookie cutter design and décor have made way for radical expressions of personality. Hand painted appliances and tiles add a dash of eye appeal with fearless colors and designs. 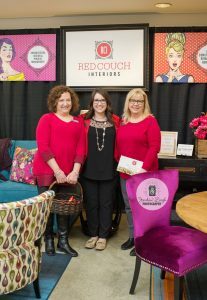 BlueStar wowed the crowd with its ability to take nearly any image and print it on ranges, hoods, or refrigerators, allowing homeowners to add florals or stripes to otherwise solid surfaces. In addition to color options which reflect the buyer’s own taste, inscriptions can be added to everything from faucets to bathtubs, furthering the trend toward singularly original design. 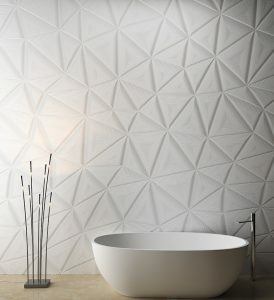 Photography courtesy of Ann Sacks, Collection: Crackle Collection by Kohler WasteLAB. Patterns are popping up everywhere as design trends lean toward character and expression. Even grab bars now present opportunities to show off color and pattern. Kohler Co. collaborated with Ann Sacks for its stunning tile Crackle Collection, which recycles unfired pottery waste to create wall tile finished with a reactive glaze for dazzling effect. Corian Design introduced new backsplash styles presented in panels that are cut into puzzle pieces, which are then pieced together on-site, to form geometric masterpieces. This easy-to-clean option can also be back-lit for added punch. Photography courtesy of Corian Design. 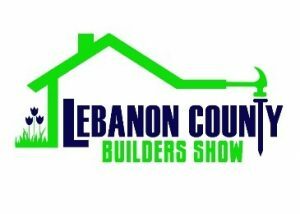 While KBIS always impresses with its cutting-edge introductions to the world of kitchen and bath design, this year was exceptional in sparking new interest for both industry trendsetters, designers and remodelers, and homeowners who are hungry for more than just the status quo. 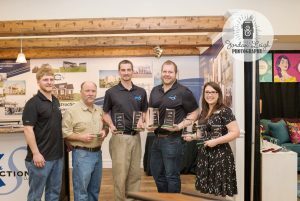 With no end to the innovative products, ideas, and technologies on the forefront, homeowners have much to look forward to as they ponder and plan their next renovation products.